Have you been looking how to how to build a website from scratch? Then you’ve come to the right place. Online presence is critical in today’s’ business environment. It’s estimated that more than 95% of consumers search for products and services online. A great way of sharing your ideas and thoughts is by building a website. However, it can be a daunting task if you have no prior experience in the field. In this article, we have summarized for you the main steps to help you learn how to build a website from scratch. When building a website, there are many platforms to choose from. The most popular one is WordPress. This software features beautiful designs and gives freedom to build anything. It can be used by freelancers, small business owners, bloggers, creative artists among others. It’s estimated that 1 out of every 5 websites is built on WordPress. The platform comes with powerful plugins and themes. This is the most preferred platform for beginners. If you know how to use Microsoft word, you’re ready to go. The free plugins can handle any website you may think of; from social networking pages to business pages. In addition, it allows the user to add subscription forms, contact forms, images etc. WordPress can handle any kind of website whether large or small. The good thing about WordPress is that you’ll never run out of uniqueness. It’s free to download and install. There are plenty of free resources on the support forums and YouTube. Other common content management systems are Drupal and Joomla. Drupal is used by experienced coders and web developers. One needs a lot of experience to use making it the wrong choice for beginners. Similarly, Joomla requires technical coding knowledge. WordPress remains the easiest platform for beginners. It features high security, high performance, customizable designs, and is SEO friendly. A domain name is a friendly Universal Resource Locator (URL) that users can type in their browser to access your website. Examples include; www.yourwebsite.com, www.wordpress.com e.t.c. Always remember the domain name is the pointer to the website. To get a domain name, you need to pay a fee to the registrar. Typically a domain name costs about $7 to $30 and can be registered in a number of sites online. This process is similar to registration of a business name. 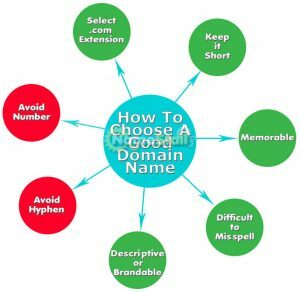 As you learn how to build a website from scratch, your domain name should be short and memorable. For instance, you can go for descriptive names that are meaningful to your target customers. Make sure the name relates to the content in your website and is easy to remember. People should easily find what you’re offering. Being unique is one of the key areas you should concentrate on. Customers like to associate themselves with a unique brand. The most commonly used extensions are .org, .net and .com. It’s recommended that you pick one to get the unique name. There are two schools of thoughts when using hyphens in your domain name. First, users are likely to forget the hyphen when typing the name in the search bar. Other scholars believe hyphens make the name look ugly. Take your time to check the name you wish to register to see if it’s available on other websites. Test the response from friends. Make sure the name you choose is not being used by your competitors or other embarrassing websites. A web host allows your website to be seen on World Wide Web. To place your web pages on the host company, you must sign up for an account. For those who don’t have prior experience on how to build a website from scratch, they should carefully choose a web host. The main role of a web host is to provide data connectivity and data space. Your website files are connected to web servers on very fast network. Once you upload resources on your site, other people are able to access them. Here, many users are put on single server. Shared hosting is very cheap because the cost is shared among the many users. The plan shares resources like CPU time, data, disk space and memory. This makes it perfect if you’re operating on a tight budget. The only downside is performance and security. Remember, if your website is sharing a server with another high traffic website, it could slow down. If you’re looking for that extra performance this may not be the best hosting plan for you. This hosting plan gives full control over the server, hardware and the operating system. The cheapest dedicated hosting service ranges between $ 50 and $ 850. Dedicated hosting is perfect if you’re looking for performance and maximum control over your website. While it gives freedom, it’s up to you in case something goes wrong. Virtual private server is more powerful than shared hosting. You don’t have to pay the high cost of dedicated hosting. Only a few sites run on the server. Most VPS hosts will offer servers that run on Linux OS. Your site operates on apportioned server area. You’ll have your own RAM, storage and data transfer limits. This gives a smooth, stable performance. If you’re planning to build a huge website, you can go for dedicated hosting plan. However, if you’re just starting a small website, VPS or shared hosting is perfect. This is arguably one of the important factors to consider when choosing a web host. You should be able to contact the customer service team 24/7. A good host company should offer multiple support services via live chat, toll free phone, email among others. If you want to handle the process on your own, you should use FAQ and other resources to solve your issues. The host should give customer support a priority. Although no web host can provide 100% up-time, they should guarantee more than 99% up-time. The host should be able to handle high and low traffic periods. It’s recommended that you check the customer reviews. Happy customers will always spread the word. The hosting provider should be able to meet the needs of your website. As a beginner, you may not be well-informed on how to build a website from scratch. It’s your duty to explain to the provider your current needs and future plans before signing up for the plan. Make sure you do the SWOT (strength, weakness, opportunities and time bound) analysis. Your business will definitely grow in future. It’s recommended that you choose a host provider that gives room for upgrade. Be sure the host can help you purchase a new domain, add more space and speed or run an entirely new website. All these plans should be available at scalable costs. You don’t have to hire a web designer even if you don’t know how to build a website from scratch. With the right information, you can design the web pages on your own. Look for editors that will allow you to build your site visually. If you are using windows as the operating system, you can use Microsoft Expression Web. It’s equipped with features both for new and experienced webmasters. You can go through the tutorial to get an idea how to design your web pages. If you are using Mac or Linux operating system, you can use Blue Griffon free editor. The type of site will influence the design. For example; an E commerce shop and informational site cannot have the same design. The tutorials will explain how to develop a navigational structure, create a site map and plan out the pages. You can also try What You See Is What You Get (WYSIWYG) web editor. Before you start designing the pages, have a clear plan of the content you need on those pages. Without proper content, your website will not reach your target audience no matter how good it looks. Whether you’re an experienced webmaster or a beginner, you can still build your website like a professional. Focus your website on solving the problem. There are hundreds of tutorials that show how to use HTML language. It’s basically a fancy structured content that gives visual formatting of content. Alternatively, you can take advantage of online platforms to help you code the content. You can do better if you learn the basics. CSS will determine how your web page will look like. Once you are fully informed how CSS works, you will be able to change the appearance of your website. Both CSS and HTML can be written on notepad or used on Adobe software. To power your website, use content management system. This is the name you gave your website on `step2’ above. This is the address of your home page. Make sure you enter the prefix `http’ first. Use the file transfer protocol (FTP) to transfer web pages from your PC to the web host server. Based on the instruction from the web host, you can put your web pages on `www’ directory. Other hosts will require you put your web pages in a public directory. Enter the username and the password the web host gave you. Click the `publish’ button and dialog box will pop up stating `uploading the page’. It will then disappear once the task is complete. Make sure the software you use comes from the hosting provider. This involves the use of specific keywords to rank high on search engines. Different methodologies and tactics are used to direct more traffic on your site. The higher your website ranks, the higher the chances it will be viewed by the next visitor. Today, social media has become a marketing tool. You can create awareness about your brand on social sites like Facebook, twitter, instagram, LinkedIn etc. Provides information who is viewing your site etc. At this point in time, you are fully informed on how to build a website from scratch. Just like I highlighted at the beginning, you don’t need technical knowledge to create a website. These 8 steps will help guide you in building your website without professional help. You must keep the information accurate to generate leads and bring results in your business.